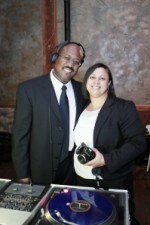 At Mobile DJ Services, we believe that joy can be obtained through music. Any day that includes the special people in your life is a good day. When love and music are involved, it seems even more distinctive. As far back as we can recall we can mark specific moments in our lives when we hear certain songs. We also believe there is something extraordinary about the sharing of emotion through music that marks an occasion as unique. Being able to bring those types of joyous memories to our clients is priceless and this is why we exist as a company. We are truly blessed to be able to do what we love and we consider it an honor and a privilege to be a part of such an extraordinary moment in your life. Creating blissful memories that will last a lifetime is what motivates us to achieve excellence. The benefit of doing what we love is evident in our client reviews. Whether meeting with clients or any of their vendors, we love to plan and collaborate with your team to deliver the highest level of service through it all. We invest much time and effort into customizing your special event, and it never feels like work. How could it? It is all about creating the distinctive event that will stand out in your and your guest’s memories. Please feel free to contact us so we can enjoy your special event together.